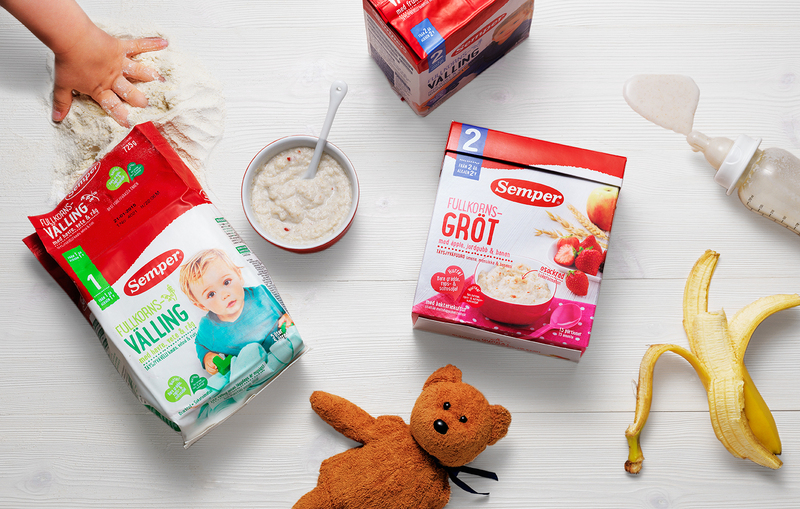 Semper is the leading company within the infant nutrition and gluten-free segment in the Nordics with a turnover of 1,5 billion SEK and 200 employees. 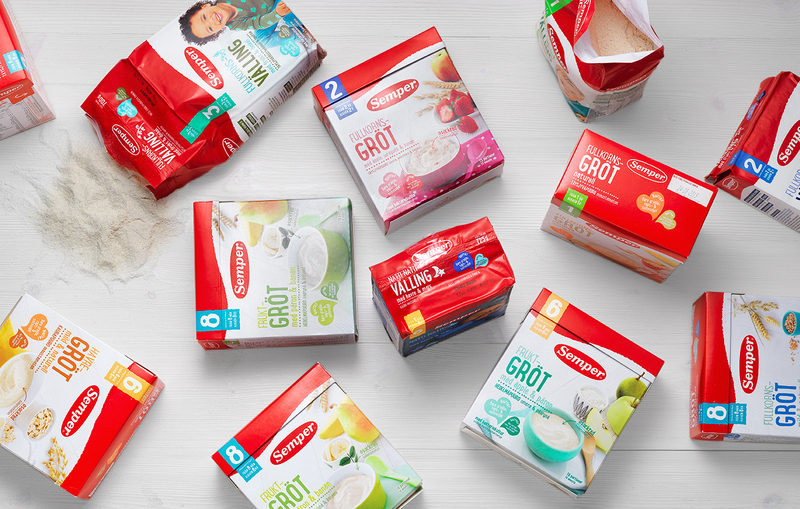 A classical and well-loved brand, Sempers history goes back to the 1930s, when a new method of drying milk was developed by Ninni Kronberg, a Swedish nutritionist. Semper is now a part of the Hero group, a global company committed to making the best possible products with natural ingredients. Loved by generations of parents and children, Semper felt the need to revitalize its design and reconnect to the brand’s Swedish roots. Semper wanted to create a modern, Nordic, warm-hearted and inviting brand experience throughout their significant portfolio. Parents want baby food that is both healthy and nutritious. The food they serve their children should be of the highest quality. From infancy to toddlers, parents also want to help their children develop their food repertoire, independence and skills and promote a healthy and open-minded approach to eating. Semper’s most recognizable design element – the Semper red colour, is what generations of Swedish parents and children have grown up with. We kept the Semper red and injected the design with a new, fresh, Nordic and natural look. Images of toddlers are accompanied by playful illustration and clear age indicators help parents find the right product for their child. 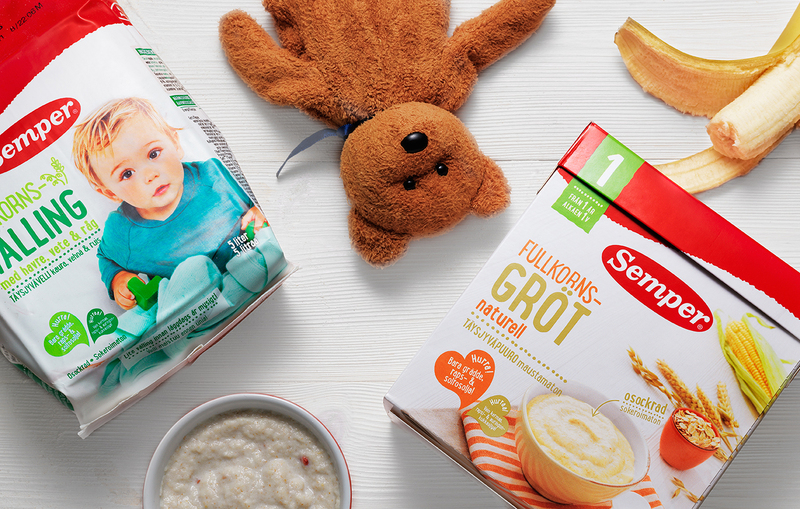 The main challenge in developing the design platform was to keep the portfolio together, from infants’ formula to toddlers’ full meal, with hundreds of SKU’s in between. We’ve been Semper’s design-partner since 2013, constantly challenging ourselves to create appealing design that is both flexible and adaptable, focusing on the beauty of natural ingredients and the brand’s Nordic roots.